Preheat oven to 400 degrees. Pat the chickpeas dry with a paper towel and pour into a medium bowl. Mix in olive oil and season with salt, pepper, and paprika. Lay the chickpeas flat on an ungreased baking sheet and roast for 30-40 minutes until the chickpeas are no longer soft. 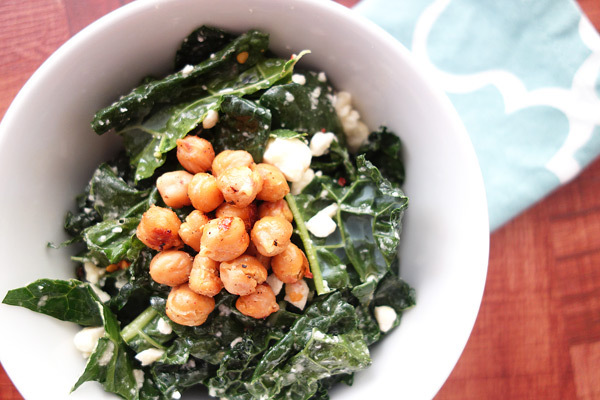 Chop kale into 1/2 inch pieces and set it aside in a medium bowl. In small bowl, mix minced garlic, salt, lemon juice, and olive oil. Refrigerate the dressing while the chickpeas roast. Pour the olive oil and lemon juice dressing over kale. Stir in the feta cheese and red pepper flakes. Top with the roasted chickpeas. This post was sponsored by Nikos Feta. We received product to create this recipe. Thank you for supporting brands that help provide great content for The Lawful Kitchen. Pat the chickpeas dry with a paper towel and pour into a medium bowl. Mix in olive oil. Lay flat on ungreased baking sheet and roast for 30-40 minutes. In small bowl, mix minced garlic, salt, lemon juice, and olive oil. Refrigerate while chickpeas roast. Pour olive oil and lemon juice dressing over kale. Stir in feta cheese and red pepper flakes.